Prepare the "salt-and-pepper" broth. Set an 8- to 12-quart soup pot over medium to medium-low heat. Lay the onions and garlic heads, cut-side down, in the pot. Cover and roast without turning until dark brown and quite soft, about 10 minutes.Meanwhile, pulverize the peppercorns, cloves, cinnamon and oregano in a spice mill or mortar.When the onion and garlic are ready, add 4 quarts of water to the pot, along with the chicken and pork. Raise the heat to high. Skim off the grayish foam that rises as the liquid comes to a boil. Reduce the heat to maintain a slow, steady simmer, then add the spices. Cut the ends off the limes and add the ends to the pot, along with 1 teaspoon salt. Slice the limes about 1/4-inch thick and set aside for serving.Roast the banana peppers over an open flame or close up under a preheated broiler until blackened and blistered all over, about 6 minutes. Cut about a 1/2-inch slit in the side of each one and add to the pot. Fry the tortilla strips. Cut the tortillas crosswise into 1/4-inch strips. (I find it easiest to roll up 2 tortillas at a time and cut them.) In large (4-quart) saucepan, heat 1/2-inch of oil over medium-high. When quite hot but not smoking (test if it's hot enough by adding a tortilla strip: it should sizzle vigorously), fry the tortilla strips in two batches, stirring them around in the oil nearly constantly, until they are golden brown and crispy. With a slotted spoon, scoop them out onto paper towels to drain. Prepare the soup. Pour off all but a generous coating of the oil from the saucepan and return to medium-heat. Add the onion, tomato and pepper to the pan and cook, stirring regularly, until soft and just beginning to color slightly. Add the broth and chicken breast. Cook 30 minutes, just until the chicken is done. Remove the chicken, cool slightly, then pull off and discard the skin. Pull the meat from the bones in large shreds; discard the bones. Taste and season the broth with salt, usually about 2 teaspoons. Serve the soup. Divide the tortilla strips and chicken between 8 large warm soup bowls. 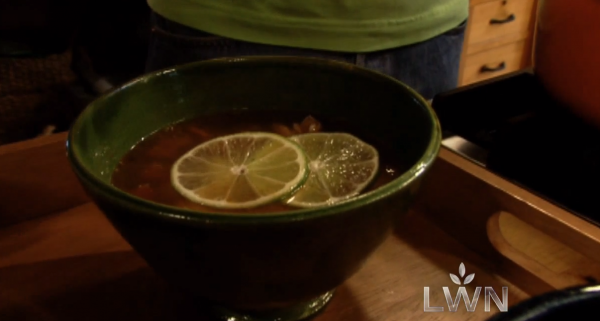 Ladle a portion of soup into each bowl and serve right away, passing the lime separately. Rick I love your recipe for the cochinita pibil Thank you for sharing My family is from Sonora and my husband from Yucatan (good combination) and we have 2 Mexican restaurants in San Diego area Your recipe is great. Thanks again.